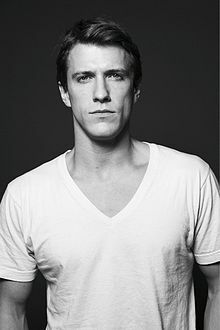 Patrick Heusinger (born February 14, 1981) is an American actor, known for his roles on the television series Girlfriends' Guide to Divorce, Gossip Girl, Royal Pains and Absentia. Heusinger was born and raised in Jacksonville, Florida, where he attended Douglas Anderson School of the Arts. He is a graduate of Juilliard. Heusinger made his debut in the 2005 independent period drama film Sweet Land, as young Lars, and then appeared in Tie a Yellow Ribbon, The Nanny Diaries, and Black Swan. On television, Heusinger is best known for the roles of Lord Marcus on the CW teen drama Gossip Girl, where he appeared on four episodes in 2008, and Adam on USA Network's Royal Pains in 2010 and 2011. He was also in a recurring role as Max McCarthy on Bravo TV's first original scripted series Girlfriends' Guide to Divorce. Other television credits include 30 Rock, The Good Wife, Law & Order: Special Victims Unit, Rescue Me, Unforgettable, and Necessary Roughness. Heusinger starred as Lancelot in the national tour of Spamalot from 2006 through 2008. In 2010, he starred in the Naked Angels' Tony-nominated Broadway production of Next Fall. Other theater credits include the off-Broadway production of Next Fall and the Broadway revival of Fiddler on the Roof (as Fyedka). In 2009, Heusinger appeared in the comedy web series Jack in a Box. In 2010 and 2011, he appeared in the comedy web series Submissions Only. In 2013, he had a guest-starring story arc on the NBC survival drama series Revolution as bounty hunter Adam. As of 2015, he has a guest-starring role on the Hulu original series, Casual as Michael, a photography teacher. Heusinger was cast as Special Agent Nick Durand in the upcoming AXN series Absentia that is set to premiere in 2017. 2009 30 Rock Brian Episode: "Generalissimo"
2009 The Good Wife Ray Demory Episode: "Fixed"
2009 Law & Order: Special Victims Unit Brady Harrison Episode: "Perverted"
2010 Rescue Me Steve Burton Episode: "Comeback"
2011 CSI: Miami Matthew Shaw Episode: "Match Made in Hell"
2011 Law & Order: LA Dan Rathman Episode: "Angel's Knoll"
2011 The Protector N/A Episode: "Wings"
2011 Necessary Roughness Cash Carson Episode: "Losing Your Swing"
2011 Unforgettable Dean Episode: "Friended"
2013 Bones Martin Proctor Episode: "The Lady on the List"
2013 Castle Raymond Vance Episode: "Number One Fan"
2015 A to Z Jay Episode: "M is for Meant to Be"
2009 Jack in a Box Coy Episode: "The Alpha Actor"
2014 Writers' Block Eli Episode: "Flirting with Disaster"
^ a b Bull, Roger. "Silliness as art". Florida Times-Union, February 15, 2008. Retrieved on June 25, 2013. ^ Kaye, Kimberly (March 22, 2010). "Straight Talk About Faith, Love and Gossip with Next Fall's Patrick Heusinger". Broadway.com. Retrieved July 6, 2014. ^ Belcher, David. "Patrick Breen and Patrick Heusinger, Actors". The New York Times, February 21, 2010. Retrieved on June 25, 2013. This page was last edited on 27 March 2019, at 04:27 (UTC).